A team of forensic anthropologists from the UK have been working with the Forensic Anthropology Foundation of Guatemala to carry out two exhumations of graves containing victims extra judicially executed by the army during the military dictatorship in the 1980s. Their findings will add to evidence being collected by the country’s state prosecutor to bring perpetrators of war crimes to justice. Once this process is complete, it is hoped that remains of victims can be given back to families for funerals to be held. The skeletal remains of a grandfather executed by soldiers more than 30 years ago during Guatemala’s brutal internal armed conflict have been exhumed and analysed by science students on a unique field trip. The group of postgraduates from the University of Lincoln, UK, were accompanied by programme leader Gillian Fowler and forensic anthropology technician Marco Perez. Gillian previously spent six years working for the Forensic Anthropology Foundation of Guatemala (FAFG) where she was involved in the exhumation of graves containing innocent victims of the uprising against the military dictatorship of the 1980s. Marco spent 12 years working for the FAFG as the Head of the Social Anthropology Unit. The team travelled to a remote region in the highlands of Guatemala to carry out two exhumations, both graves containing victims extra judicially executed by the army. Accompanied by archaeologists from the FAFG, they exhumed the body of a man in the village of Batz Chocola, a three hour drive from the town of Nebaj. Family members were present as the remains of the grandfather were uncovered. The second exhumation took place on an ex-military base, on the outskirts of Cotzal, near to Nebaj, where the students spent three further days digging trenches. On the third day one trench revealed clothing and further careful excavation uncovered a grave of six individuals. They had been thrown into the grave and all had their hands tied. Ballistic evidence was also recovered from the grave, indicating the victims had been shot. Back in Guatemala City, the group of students from Lincoln’s MSc Forensic Anthropology programme returned to the FAFG laboratory to analyse the remains. Their findings will add to evidence being collected by the country’s state prosecutor to bring perpetrators of war crimes to justice. 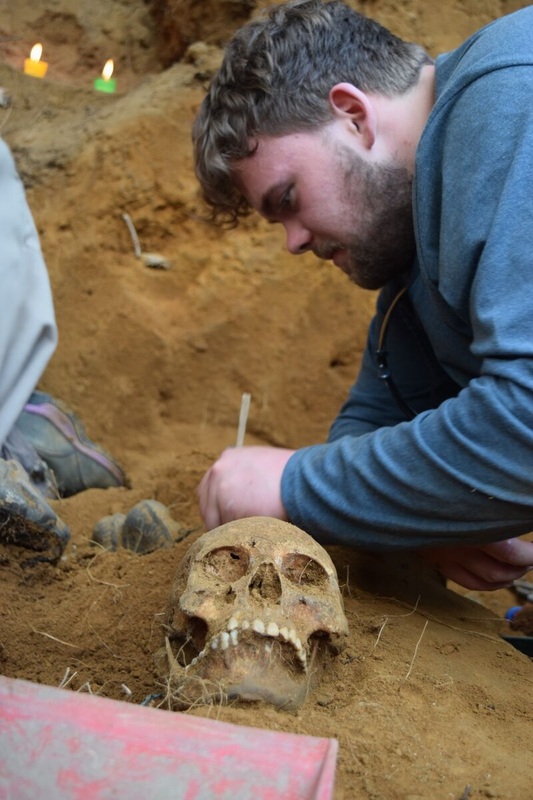 Gillian Fowler, Senior Lecturer in the University of Lincoln’s School of Life Sciences, leads the MSc in Forensic Anthropology and established the student field work with the FAFG. Recognised internationally for her work on mass grave exhumations, she has also been involved with the Afghan Forensic Science Organisation (AFSO) from its inception in 2010 and contributed to a special report which outlines steps Afghanistan can take to help identify the victims of the country’s 35-year conflict. She said: “The students have been well-trained throughout their course to carry out complicated analytical tasks taking instruction in Spanish and the FAFG were very impressed with their abilities. The final day was spent in the FAFG’s DNA lab where they worked on family reference samples and prepared bone samples for DNA extraction and analysis.